It has finally happened. The writing was on the wall all along, of course – Opeth titled their third album after a Comus lyric, their fifth after German hard-proggers Blackwater Park, and even stole a song title, 'For Absent Friends,' from Genesis. But it's taken until Heritage, the band's tenth release, for Mikael Åkerfeldt to truly succumb to his long-bridled lust for the heady days of 70s prog. The sleeve tells you all you need to know – it's a colourfully symbolic diorama that depicts the band's sonic shift as a tree with its roots in Hell. This one reeks of patchouli oil before you've even put it on the turntable. Opeth have made their name as a death metal band, and fans of Åkerfeldt's distinguished growl will be dismayed to learn that it has been subjected to a self-imposed ban for Heritage's sixty-five odd minutes. But they should be braced for this decision already; regular listeners will know that the band have always been keen to balance their metal tendencies with nimble jazz flourishes and sprawling, baroque melodies. After all, Damnation, the acoustic counterpart to their heaviest offering Deliverance was comprised of soft acoustic songs, drenched in dreamy Mellotron. But Heritage isn't another excursion into that territory. Rather, it sees the four Swedes (and one Uruguayan) apply their consummate virtuosity and mind-boggling invention onto a daring affirmation of their fusty pre-punk roots. While headbangers who were recruited when the band released Ghost Reveries on Roadrunner Records might baulk at the mellowed sound, Heritage certainly seems a logical step when considering the discography as a whole, and silences the tiresome 'sellout' catcalls that they suffered in the wake of signing to the label. Åkerfeldt is 37, and at this point it's hard to refuse him the opportunity to indulge with the top-drawer coven of musicians he's gathered around him –tellingly, all but one enlisted after 2005. The new blood have brought a kaleidoscopic tapestry of sound to the table; flutes, organs, Mellotrons, and even a burst of jazz piano blend to conjure an ornate atmosphere. Heritage has already been accused of listlessness and indulgence, forsaking the quiet/loud dynamic that has made Opeth so identifiable. But that quality is still extant throughout, albeit in a subtler, more refined incarnation. Light and shade, beauty and ugliness – these are the juxtapositions that Åkerfeldt delights in capturing, and, while the metal bombast is absent, they remain the underlying foundation of the record. The title track opens the LP, a short introit that draws on the klavierwerke of fellow Swede Jan Johansson, and is immediately blown into the dust by standout 'The Devil's Orchard,' a tempo-shifting but catchy workout featuring percussion that suggests a disciple of Bill Bruford is on the drum stool and culminating in a gloriously ragged Gilmouresque guitar solo. On this wriggling, unpredictable track the band's 'metal' darkness is replaced by a no less ominous bout of riffing that calls to mind scary proggers like Van Der Graaf Generator, Black Widow and German Oak, a vibe that pervades the eight songs that follow it. Although Porcupine Tree's Steven Wilson is twiddling knobs in the production chair, it's safe to say that this is the first Opeth release that wholly rejects the modern 'progressive metal' scene. 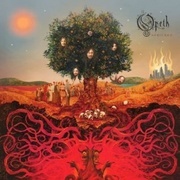 Rather than the Porcupines or the similarly staid Dream Theater, Opeth here sound more in tandem with the likes of Astra, Diagonal and Blood Ceremony – bands unashamed to delve into the sonic frameworks of the Seventies and dredge them into something avowedly heavier. The band covers ground with giant footsteps across the record. 'Slither' brandishes a taut, groovy riff and the kind of fiery organ that used to make prog crazies like Salem Mass tick. 'Nepenthe' starts out as a ruminative, evocative piece, possessing all the misty effect that a song about Ancient Greek antidepressants needs, before it's swept along on skittering drums and interjected by macho, snaking displays of the band's musical proficiency. 'Famine' positively blossoms with flutes, effervescing acoustics and Åkerfeldt's accomplished croon, indisputably the centerpiece of the record. While the album is often indulgent, this isn't necessarily a downfall. After all, even the greatest prog opuses were unvaryingly subject to a little flab around the edges – anyone who has an ounce of affection for the genre knows this and accepts it. Sure, Heritage is subject to the retrospective trappings that have seemed to plague all corners of the musical world of late, but their innovation, confidence and flair goes a long way in redeeming them. Opeth's most intriguing characteristic has long been their ability to counter their more extravagant qualities with a military tightness and sheer brute force. Despite certainly lacking a little of the latter, Heritage still manages to capture the terrible beauty which has long been Åkerfeldt's trademark, and stands alone as a valid and valiant entry into the band's considerable canon.